A specialist in medical and cosmetic dermatology, Tamara Dudas Pride, PA-C is an important part of the Mohs Surgery & Dermatology Center team, with locations in Elgin, Huntley, and Crystal Lake, Illinois. Tamara completed her undergraduate studies at the University of Iowa, then went on to graduate from Midwestern University’s physician assistant program and has been practicing in the field of dermatology since 2001. 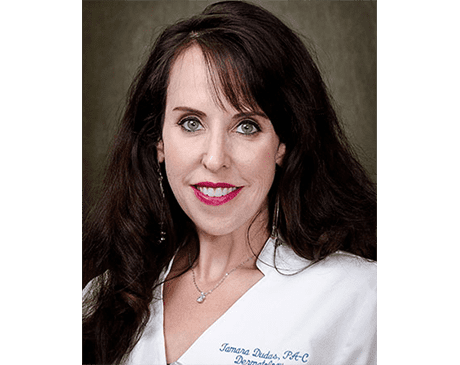 In addition to her 17 years in private practice, Tamara has served as an adjunct faculty member of Midwestern University, where she teaches numerous courses and holds workshops instructing students in the area of dermatological surgery. Having served as president of the Illinois Society of Dermatology Physician Assistants, Tamara is a leader in her field. She also offers her expertise as a consultant and speaker for multiple pharmaceutical companies, and she actively participates in leadership roles for multiple clinical research trials. With this wide range of experience, Tamara brings extensive, up-to-date, comprehensive knowledge to Mohs Surgery & Dermatology Center. She is committed to providing effective, holistic treatment for each and every patient.